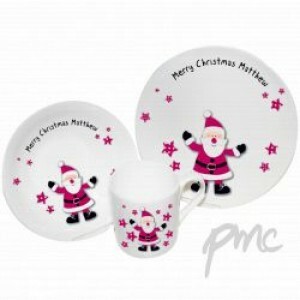 The breakfast set consists of a bowl, plate and mug all featuring a very jolly Santa surrounded by spotty stars and the words " Merry Christmas" followed by the child's first name (12 charactors max). The wording 'Merry Christmas' is standard text. Santa Breakfast Set is a fantastic bone china Santa breakfast set really does make the perfect Christmas gift for a little one. A truly lovely keepsake gift for Baby's 1st Christmas.